Tropical Cyclone Bianca heads towards Perth. Picture: Landgate. Source: PerthNow. 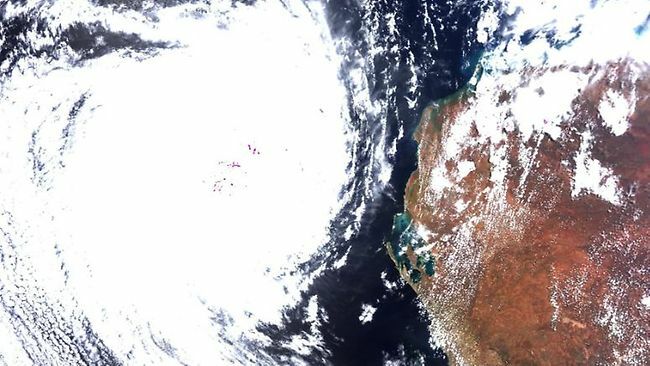 I’ve been frantically writing a few blog posts and working on a short story, but if you don’t hear from me tomorrow, it’s because there’s a dirty big tropical cyclone (Bianca is her name, and she’s gonna make sure Western Australia doesn’t forget it!) about to stomp all over the south west corner of Australia. To make things worse, we had a 38 degree, extreme  UV day today (although a spot of rain and clouds diminished this!) and we’re faced with severe bushfire warnings tomorrow (cos of the high heat and ridiculously strong winds). As I said on Facebook, living in Perth right now is like living inside a hair dryer. So yeah, I’ll catch you on the flipside! We got your hot weather – 45 degrees in the shade here today. Sorry, mate. Maybe Perth will get the hot stuff next time?